Focus Pro is designed to reduce operating costs while helping you make smarter decisions through advanced attendance monitoring. Originally developed to monitor and manage employee time in businesses such as factories, offices and hotels, the software is flexible enough to keep track of attendances in schools, colleges and clubs where the term ‘employee’ can be substituted with ‘student’, ‘club member’ etc. Focus Pro eliminates tedious adding up of hours manually by automatically calculating the hours and rates your employees should be paid. The system is flexible enough to calculate which employees are eligible for basic pay, overtime and bonuses, while allowing you to account for grace periods, rounding rules, work breaks and more. Although the system can handle the shift patterns and rules of most organisations as standard, we can often write customised scripts tailored to meet more specialised needs. Enjoy fully editable timesheets allowing you (and other managers and supervisors) to amend or add clockings and adjust time accrued. User access to the software can be configured to restrict or allow access to specific groups of employees and determine what actions each user can take. A full audit log records all actions and events. Export hours directly out of Focus Pro and transfer them into your payroll package: Sage Payroll Professional, Sage Micropay, Iris, Earnie, Pegasus and Quantum. You can export the data to PDF, CSV or MS Excel with a range of comprehensive summary payroll reports allowing manual control of your payroll. The absence management function of Focus Pro allows for the configuration of any number of reasons from dentist appointments to paternity leave. 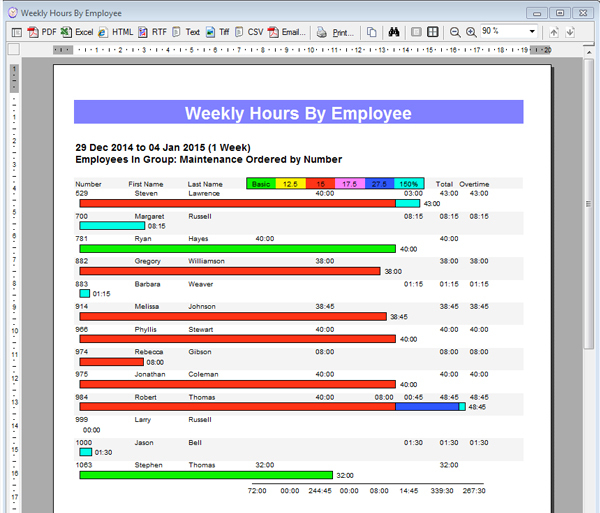 You can pre or post book absences using the employee’s timesheet, calendar or workforce availability screen. The advanced holiday feature allows you to determine holiday entitlement in days or hours across any holiday year, including carryover with end-of-year balances, all supported by a full series of reports. 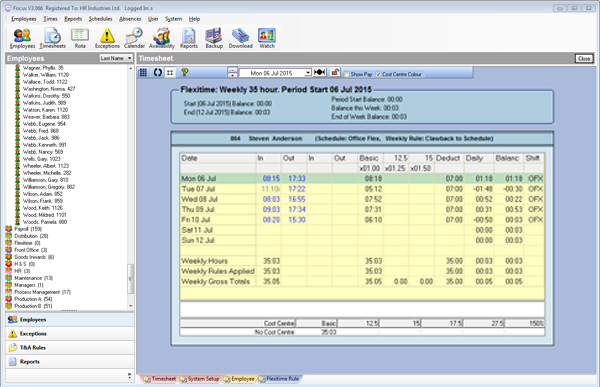 Focus pro monitors unpermitted absences when an employee was expected in work but did not clock in for the day – as highlighted in the Exceptions facility. You can also track lateness and other infringements such as extended break times using the timesheets and infringements report. Focus Pro will generate fire evacuation reports and send them to any number of defined printers using just a one-click button or via a shortcut on your desktop computer. If connected to your fire alarm panel, the HRX proximity clocking terminals available with Focus Pro can automatically send a fire evacuation report to a serial printer when the alarm sounds. The Watch Window within the employee attendance software provides a real-time view of who is currently clocked in and the Who’s In report allows you to identify who was in at any specific time and date in the past. Focus Pro will generate a wide range of reports to help managers and senior members of staff to monitor employees’ and departmental performance, review compliance, plan budgets and more. Reports cover The Bradford Factor that highlights employees with disruptive attendance patterns and Working Time Regulation to ensure you remain compliant with the rules of the European Working Time Directive. Focus Pro facilitates the easy recording and storage of employees’ details such as addresses, telephone numbers, National Insurance numbers and more. 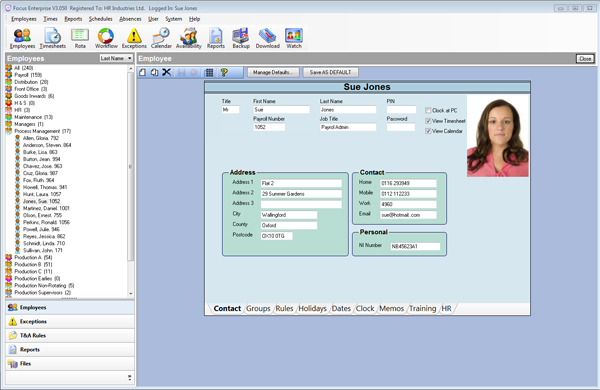 The system allows you to set up additional text, numeric and date fields to build a complete picture of your workforce. 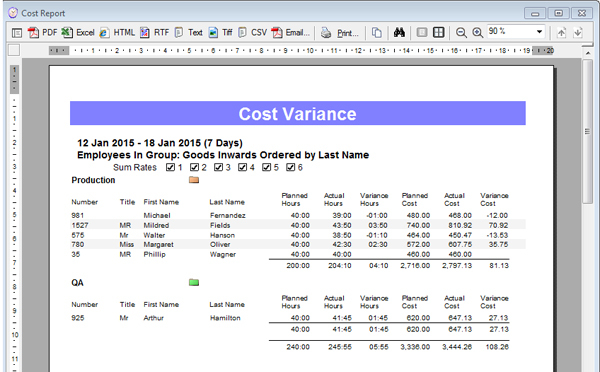 You can generate reports on all kinds of specifics. You may wish to know the addresses of all employees who joined the company within the last three months, for instance. Or you may wish to know all those with over 10 years’ service to implement a reward scheme. If your company doesn’t operate a fixed shift pattern, Focus Pro’s employee rota can plan shifts for you. This feature displays planned hours and costs by day and by employee allowing you to control budgets and to plan staff demand according to fluctuations in demand. 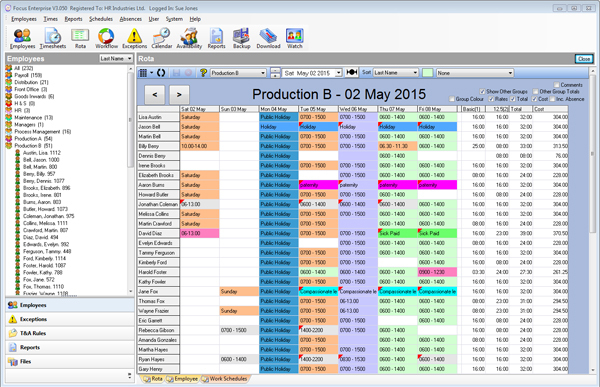 Clients in hotel and catering sectors find this tool particularly useful, but it is easily adapted to any field where employees work variable shifts. If your company allows employees to work flexible hours, this feature is particularly useful. It can be combined with shift rules to track attendance during core hours and on specific days of the week. Full reports are available to keep managers and supervisors fully appraised. Where the control of doors, gates and turnstiles is critical to the security and safety of your business, Focus Pro, (in conjunction with our HRX5000 proximity clocking terminal), allows you to determine which employee(s) are permitted access as stipulated by your pre-configured day and time rules.